Liberia and Sierra Leone were both established in the nineteenth century as nations or colonies for black Europeans and Americans either freed from the slave trade or born free, as well as returnees to the continent from captured slave ships. Immigrants from the United States, Canada, and the Caribbean moved to Liberia and Sierra Leone throughout the nineteenth and early twentieth centuries, creating and filling governing structures in both countries. This history makes for a unique mixture of cultures and policies that ultimately resulted in civil wars in the late twentieth century. Sierra Leone and Liberia’s colonial histories and relationships with Great Britain and the United States (respectively) are important to recognize in approaching the arts of this region. This lecture outline covers both indigenous and imported art practices in the region, ranging from the nineteenth century to the present. As in other African arts, the visual arts of Liberia and Sierra Leone are intimately connected to performance and music and are placed within those broader artistic traditions. Art from Liberia and Sierra Leone reflect(ed) distinct cultural groups, and the engagement of those communities with a global audience. Both Liberia and Sierra Leone are part of a broader Atlantic world in constant contact with Europe and the Americas through trade and immigration. This lesson features prestige objects—that is, artworks that convey power, politics, and community ideals and concepts, or artworks that explore spiritual relationships—and body arts in media ranging from textiles to metal arts, wood, and photography. All of the artworks are grounded within their local contexts and aesthetics, but they are also connected to the rest of the Atlantic world in a manner that emphasizes how Liberian and Sierra Leonean artists and patrons belong(ed) to both. Variations in attribution (named artists, unidentified [culture] artist) are due to the way that objects were collected by museums, not because the artists were, in fact, anonymous. African artists rarely created works anonymously, and the names of artists would have been well known within their communities. Mentioning the context of artistic collection to students is important: European and American collectors may not have spoken the relevant languages or asked questions regarding the objects they purchased or commandeered on site, though the names of some artists have been resuscitated from archival documents and later twentieth-century anthropological and art historical fieldwork. John Leh, Soldier, mid-twentieth century, brass. Minneapolis Institute of Arts. Viditz-Ward, Vera. “Photography in Sierra Leone: 1850–1918.” Africa: Journal of the International African Institute, Vol. 57, No. 4, Sierra Leone, 1787-1987 (1987), 510–8. Ruth B. Phillips. “Masking in Mende Sande Society Initiation Rituals.” Africa: Journal of the International African Institute, Vol. 48, No. 3 (1978), 265–77. Indiana University Liberian archives (photographs and text for instructors). Sierra Leone heritage organization (images, artworks, video). A recent museum exhibition on Liberia and Sierra Leone. University of Iowa Art Museum on Liberia and Sierra Leone. Read more about the founding of Liberia here (also contains videos). Visually analyze artworks of Liberia and Sierra Leone. Use region-specific vocabulary to discuss arts of Liberia and Sierra Leone within the aesthetic criteria of their location. Describe and place into context Liberian and Sierra Leonean arts related to prestige, spirituality, and the body, in West Africa and the greater Atlantic world. American Colonization Society: an American philanthropic organization begun in the late eighteenth century. In the nineteenth century, the society organized and funded immigrants to Liberia. The society also managed the administration of the colony’s economy until the Republic of Liberia declared independence in 1847. Ge/Gle: Dan terms, referring to both the invisible spiritual forces and masks of the forests. Occasionally, these forces and masks may enter the earthly realm of the village. They manifest in material form in a variety of masks and performances. Masquerade: In West Africa, masquerade refers to performance. The masks and textiles (made of fabrics or vegetal materials) are material forms of performers or spirits who perform for a variety of audiences. Masquerades are performed for political, seasonal, religious, and entertainment occasions, and incorporate dance, singing, and musical performance. Poro: a men’s organization found in various regions of Sierra Leone, Guinea, Liberia, and Ivory Coast. Poro is historically both a political and social organization structuring communities and administrating judicial manners. Its role in national politics continuously changed throughout the twentieth century. Its importance in local communities has been addressed by a number of scholars, and various presidents of Liberia joined the organization as well. A number of masking traditions and material culture objects are associated with performance of Poro activities and status of members. Sale/hale: Two terms, hale (Mende) and sale (Loma) are often used to discuss the power wielded by the spirits associated with masquerading; the terms signify the specialized knowledge or “medicine” gained through spiritual assistance. Masks appear as physical manifestations of the acquisition or manipulation of sale or hale. Sande: a women’s organization in Sierra Leone, Liberia, and Guinea. Sande is the only women’s organization to have masquerading traditions performed by women. Girls are initiated into Sande, becoming adult members of their communities, after an educational period “in the bush,” during which they are instructed in domestic and spiritual duties. Wunkirmian: a Dan term, roughly translated as “spoon associated with feasts” (also known as a wake mia, among other Dan terms. See Metropolitan Museum Timeline of Art History). Wielded at important occasions by a village or town’s most hospitable woman, it is her responsibility to distribute gain and money to local people. Spoons vary in size, generally 1–2’ in length, characterized by a large spoon end with the handle carved with figural or decorative forms. Bullom or Temne artist in Sapi-Portuguese style, Hunting horn, late fifteenth century, ivory and metal, 25 1/4 x 6 7/16 x 3 9/16”, National Museum of African Art. Vani Sona, Ndoli Jowei (Helmet mask) for Sande Society, twentieth century, wood and pigment, 16 x 7 3/4 x 10 1/4”, Sierra Leone. Brooklyn Museum. Unidentified Mende artist, Pendant and chain, late nineteenth century, silver, 5 3/4 x 6 3/4 x 1”, Brooklyn Museum. Unidentified Mende artist, Gbini Mask, early twentieth century, wood, leopard skin, sheepskin, antelope skin, raffia fiber, raffia fiber twine, cotton cloth, cotton string, cowrie shells, 17” tall; crown of headdress: 6 x 11 x 15”; b Headcrest b: 6 1/2 x 8 1/2”; c Headcrest: 6 3/4 x 8” ; d Headcrest: 6 1/4 x 8 3/4”. Brooklyn Museum. Alphonso Lisk-Carew, “A Typical Fitish Dancing Girl, Upper Mendi, Sierra Leone”, c. 1907, postcard, Gary Schulze collection. “A Gold Coast Doctor,” c. 1930, trade card published by Quality Cigarettes, J.A. Pattreiouex, Manchester. Photograph by Lisk-Carew, c. 1910. National Museum of African Art, Smithsonian Institution. Martha Ricks, Coffee Tree quilt, on display at the International and Cotton States Exposition, Atlanta, GA, 1895. BW Kilburn stereoview collection, Littleton Public Library, NH. Flags coverlet, diplomatic gift from WVS Tubman to JFK, 1963, satin. JFK Library and Archives. Unidentified maker, Factory printed cloth “Queen Elizabeth II”, 1961, Sierra Leone, cotton and dye. National Museum of African Art. Unidentified maker, Factory printed cloth “UPP Party”, c. 1961, Sierra Leone, cotton and dye. National Museum of African Art. Gbokowa of Ngarlu (from Bo District), Country Cloth, c. 1900, silk, cotton, and dye, 427 x 172 cm, Sierra Leone. British Museum. Unidentified Mende artist, Side-Blown Horn, early twentieth century, ivory and wood, 26 ¾” long. Minneapolis Institute of Arts. Unidentified Mano artist, Deangle Mask, 1939, wood, cotton, fiber, metal, cowrie shells, feathers, and vegetable dyes, 78 x 29 ¼ x 28 ¾”. Harn Museum of Art, University of Florida. Zlan of Belewale, Ceremonial Spoon (Wakemia or Wunkirmian), before 1960, wood, fiber, metal, pigment, 5 ¼ x 23”. Metropolitan Museum of Art. Liberia and Sierra Leone are situated on the West Coast of Africa. Multiple migrations saw people from the interior of West Africa move towards each nation’s coasts, resulting in numerous population shifts between the fifteenth century and today. Before European arrival, Bulom (Sherbro), Temne, and Limba peoples lived primarily along the coastline, with Mende and Fulani peoples settling in the fifteenth century. Both countries had contact with the Atlantic world through European traders beginning by at least the 1460s. The Portuguese nicknames for these two coastlines stuck—you’ll hear the “Pepper Coast” for Liberia (alluding to its coveted spicy Malagueta pepper), and Sierra Leone owes its name to the Portuguese for “Lioness Mountains.” Both countries were established in the eighteenth–nineteenth century as settlements for the liberated descendents of Africans after the abolition of the Atlantic slave trade, some of whom had never set foot on the African continent. Sierra Leone was conceived of as the “Province of Freedom,” and Thomas Peters, an African-American man from Nova Scotia, established its capital Freetown in 1792. It was declared a colony of Britain in 1807–8. The British administered Sierra Leone, and the American Colonization Society, an independent organization in the United States, ran Liberia until the Republic declared independence. Both countries’ present-day governments echo those origins. American settlers first arrived along the Grain Coast (another Portuguese name for the region) in 1820, and the Republic of Liberia declared independence in 1847. Sierra Leone achieved independence from Great Britain in 1961. A mixed indigenous and immigrant population characterizes both nations (see Map for regional distribution), and relationships between European-American and indigenous African peoples have, over the centuries, been fraught as imported governing and cultural systems alternately meshed and clashed with indigenous ones. The relationship between Sierra Leone and Liberia and Britain and the United States remained close over the twentieth century, one example being the critical rubber contribution that Liberia made to the American effort during World War II. More recent history is characterized by civil wars in the 1990s to early 2000s, the election of Ellen Johnson Sirleaf (the first elected female head of state on the African continent in 2006), and the present-day Ebola epidemic. The arts in this lecture reflect the tight cross-continental relationships of people within these countries, as well as the deeply rooted prestige arts of the region and the visual expression of political, community, and spiritual ideals. In the Hunting Horn, one can observe the mixture of media, style, and subject matter that occurred when a local carver produced art for a foreign patron. This piece impresses upon the viewer the historical connection of the region to the rest of the Atlantic world. West African carved ivories were valued in Europe due to the quality of their material and carving, and exquisitely carved horns and salt cellars from the fifteenth and sixteenth centuries are popular objects in museum collections. These horns were consistently used as royal gifts. This piece has heraldic shields and inscriptions in Greek dating it to between 1494 and 1500 and designating it as a gift from Prince Manuel I of Portugal to King Ferdinand V of Castile and Aragon. The artist likely incorporated Portuguese prints or drawings into his own aesthetic system, melding the two to please a foreign patron. The imagery thus includes European content combined with the frontal, flatter presentation of figures and animals and the intense articulation of geometric patterning typical of regional carving in Sierra Leone (and a style often found in Western Africa during this time period). Note the way that the carving is separated into registers, each with separately carved scenes featuring animals, human figures, and geometric and vegetal designs. Each register has both high- and low-relief carving, creating a visual interplay as the surface varies around the horn. Three of the five S-shaped ivory loops have metal chains attached, likely for ease in publicly presenting the object. Kathy Curnow cites Portuguese accounts of these ivories in an article on a salt cellar at the Oberlin University museum: “In the early sixteenth century, a Portuguese traveler wrote: ‘In Serra Lyoa, the men are very skillful and very ingenious; they make all the things we ask them to out of ivory and these objects are marvelous to see—like spoons or saltcellars or the handles of daggers and other subtleties,’ and ‘[they] can carve any work one draws for them.’ (Valentim Fernandes, Description de la côte occidentale d’Afrique (1506-1510), Théodore Monod, Avelino Teixeira da Mota, and Raymond Mauny, eds., vol. 11 (Bissau, 1951), 96–7, 104–5). More information is available on the Oberlin University website and in the Met’s Afro-Portuguese ivories article. Sande is a women’s society in many parts of Sierra Leone and Liberia (as well as parts of Guinea and the Ivory Coast), a complementary society to the men’s association Poro. Young women enter the society through an educational period that takes place in “the bush” (in seclusion outside of the village in cohorts of pre-teen and teenage women every few years), during which they are trained in cultural and practical matters for living in their communities. The bush education ends with clitoridectomy and initiation into the society, although clitoridectomy is increasingly criticized both outside of and within West African countries. The society binds women together within a community and is a powerful patron of the arts in this four-country region. Hundreds of Sande society masks are in museum collections today, and more still dance in West African communities. This is the only mask in West Africa exclusively danced by women, although it is always carved by a man. The Ndoli Jowei represents the community’s guardian spirit and is characterized by a tripartite structure: the neck, face, and coiffure. It illustrates ideals of feminine beauty, although there is a wide variation in execution of the mask dependent on the community. There are, however, similarities. A broad and high forehead, delicate features, small face, and elegant coiffure are essential. Hairdressing, especially of elaborate styles, necessitates community cooperation. This piece may have been based on an image (on a coin) of Queen Victoria, who was an emblem of womanhood, power, and leadership in the nineteenth century. It incorporates an elaborate crown atop a diamond-patterned coiffure. In practice, palm fiber, or raffia, would be attached to holes lining the bottom of the helmet mask, and the masquerade attire completed with fabric covering the entirety of the body. To understand how the mask moves, you could show your students the linked Sowei mask video, and to compare many Ndoli Jowei masks together, walk (vicariously) through a recent exhibition of Sande society masks from the Imperato collection. Sande society masks make for excellent stylistic and compare and contrast questions about aesthetic preferences in different regions, identifying hands of artists whose names were not recorded, and can inspire questions related to other women’s arts in the region like hairstyling. Accompanying the Sande mask is the Pendant and Chain. Mende blacksmiths melted down foreign silver currencies to create jewelry worn as prestige objects for women in the Sande society. Jewelry made from Maria Theresa thalers, Napoleonic five-Franc coins, and American silver dollars are noted in archival documents from the late eighteenth century to the present. Often square with geometric designs (fine filigree work characterizes many nineteenth-century pieces), the pendants may or may not function as containers for protective Islamic verses or magic numbers found in other parts of West Africa. You can include the pendant in your discussion to reinforce the idea that multiple media convey status and prestige within the Sande society. This Postcard and Trade Card each feature a photograph of a Sande initiate by the Sierra Leonean photographer Alphonso Lisk-Carew. The Lisk-Carews (Alphonso and Arthur) opened a photography business in 1905, “advertised as ‘Photographers, importers of photographic materials, stationery, toys, fancy goods, etc., 3 East Brook Lane and 30, corner of Westmoreland and Gloucester Streets [Freetown, Sierra Leone].” According to Nanina Guyer, they photographed the African interior and also traveled to Gambia around 1912. In 1910, these prominent artists were appointed photographers for the visit of the Duke of Connaught. Lisk-Carew used an 8 x 10”- or 11 x 14”-camera and made exposures on glass-plate negatives, contact-printed by sunlight onto albumen paper. Known for his compositions, Lisk-Carew made both studio and field portraits. Ask undergraduates to consider the relative roles of photographer and subject; how much agency did young women have in posing for the photographer? The costume that the sitter wears in the postcard is a combination of masquerader attire; the leather flaps she wears traditionally were associated with entertainment and worn by men. The seated positioning (again, according to Guyer) was associated for Mende women with “acts of belonging, becoming, arriving, and being,” appropriate signifiers for the educational period of seclusion in the Sande bush school. As for the photographic objects in the slide, ask students to consider what they know from the previous piece: the society mask and its corresponding video. How is this photograph of a Sande initiate framed (twice) by foreign audiences, and to what effect? These photographs offer an opportunity to have a classroom discussion about representation and stereotype in African photography, and also about the imagery, attire, and content in the photograph. Looking at “A Gold Coast Doctor,” one can discuss how the same photograph was reproduced and re-captioned. The new caption changes the gender of the photographic subject and ignores the cultural context, placing a mythical, exoticized meaning onto the young woman pictured. This is a good opportunity to explore image appropriation and the way that people in Europe and the United States used and circulated images of people on the African continent. Ask students to think about how the circulation of an image like Gold Coast doctor shaped the idea of West Africa for people who patronized the product this photographed accompanied (cigarettes). An essay good for undergraduates investigating nuance and representation in these photographs is Nanina Guyer, “Extending the Stage: Photograph and Sande Initiates in the Early Twentieth Century,” in Visions from the Forests: The Arts of Liberia and Sierra Leone, 2014. For a cross-cultural connection, have students compare the work of the Lisk-Carews to that of the African-American daguerreotypist Augustus Washington, who worked in the U.S. and Liberia. See more on Washington here. A Liberian woman, Martha Ann Ricks (nee Erskine), made the Coffee Tree quilt in the upper right-hand corner of this stereograph image. Born into slavery in Tennessee in the United States (a distinction made necessary by the fact that many Liberian counties bear the names of U.S. states), Ricks’ father moved her entire family to Liberia in 1830. Because her father was a pastor, Ricks was literate when she moved to Liberia, and she is one of the few women immigrants for which there are archival documents recording her impressions of Liberia as that new nation formed. Ricks wrote to the American agents of the American Colonization Society regularly, and her letters were published in their journal, the Repository (students can see her letters and issues of the journal online at the Library of Congress). Ricks’ artwork featured in the first National Fairs in Liberia in 1857 and 1858, where she won a monetary award for her sewing skills. In 1892, she reached international prominence when she traveled to London to have an audience with Queen Victoria (students can see records of this visit in historical newspapers and in the digitized copy of the Queen’s diary), where she presented the monarch—and ideal of genteel Victorian-era womanhood—with a silk quilt featuring images of a coffee tree. Coffee was, at the time, Liberia’s primary export. The Victoria quilt was sent by the monarch to be shown in Liberia’s exhibit at the 1893 World’s Columbian Exposition in Chicago. The quilt seen in the stereograph is a copy commissioned by American Methodist Episcopal Church bishop Henry McNeal Turner, who purchased it from Ricks when he visited Liberia after the Chicago fair. He exhibited the second quilt in Atlanta at the 1895 Cotton States and International Exposition. Ricks’ quilts were the first Liberian quilts used as diplomatic gifts, although the tradition of gifting textiles was common in Liberia prior to the arrival of the colonists. Since 1892, Liberian quilts have been the national diplomatic gift. They are characterized by applique (small, cut pieces of cloth) laid onto a large ground (often white or beige) in wither silk or cotton. Quilts are three-layered textiles with a decorative top, a center layer of batting (more often cotton), and a plain back, stitched together in a decorative pattern through all three layers. The composition is that of a medallion quilt, which features a large central design surrounded by one to three framing borders. Fabrics used in nineteenth-century quilts were often imported American cottons purchased in Monrovia. Quilts were all made by hand, with the primary quilting patterns being squares, diamonds, or triangles, and three to five layers of echo quilting around the applique designs, making the patterns appear to radiate outward. Students might also note the context of exhibition of Ricks’ quilt, placed atop hand-woven country cloths. Women made quilts in Liberia, in contrast with other textile practices; country cloth was only woven by men. Students will also notice the disjunction between the label of the exhibit: “Uncivilized Africans exhibits,” with the imported quilt-making tradition directly behind it—another good beginning for discussing exhibition contexts for African art in general in the nineteenth and early-twentieth centuries. Additionally, students might discuss the portrait of Martha Ricks taken during her trip to London, addressing her pose and attire. A second quilt—the Flags Coverlet—was gifted to American president John F. Kennedy by Liberian president W.V.S. Tubman during a state visit in 1961. Following the precedent set by Ricks, the quilt has a medallion compositional structure with a central design of the Liberian and American flags and red, white, and blue framing borders. The quilt maker is unidentified in archival records but likely heralded from a town nearby Monrovia (Bensonville, Arthington, or Caldwell), where the major quilt guilds worked before the civil war and continue to work today. Observant students will note that the quilt being gifted in the context photograph is different from the quilt in the collection; the original gift quilt had an incorrect number of stripes in the American flag, so a new one was commissioned. Another important textile tradition in West Africa (with its local manifestations in Sierra Leone and Liberia featured here) is the printing of Factory Cloth for local consumption. Factory cloth was produced in Europe (primarily Holland or Manchester) for the African and American markets, although it was originally designated for Southeast Asia, where it did not sell. It has since become ubiquitous in Western Africa, often called lapa or fanti. This particular cloth commemorated a cancelled 1959 tour by Queen Elizabeth II to Sierra Leone. The Queen made the trip in 1961, the year of Sierra Leonean independence. The cloth features portraits of the Queen and Prince Philip in floral-bordered circular frames amidst government buildings and architecture in London and Freetown. This can be compared to the “UPP Party” cloth from 1961. Also from NMAFA: “After the April 26, 1961 Independence of Sierra Leone, a number of fabric designs referred to the new political leaders and parties. The rooster was the emblem of the opposition party, the UPP—The United Progressive Party. Their motto was ‘Unity, Prosperity, Progress.’” Today, political parties and officials are regularly featured on printed cloth designs. Ask students to consider how this type of cloth would have been cut and worn, reminding them that—although museum collections often feature large swaths of fabric—the contextual presentation of this type of cloth would be cut and sewn into clothing. Another prestige textile found in various manifestations all over West Africa is strip-woven, indigo-dyed Country Cloth. Woven from cotton and silk-cotton from the indigenous silk-cotton tree, these textiles are woven in long strips by men and sewn together to create a larger textile. This piece from the British Museum’s collection is composed of thirteen plain-weave strips of woven cotton dyed in indigo and green, as well a silk dyed magenta (weft) and natural, undyed cotton warps. See this video for demonstration of the weaving procedure in Sierra Leone, or Lisa Aronson’s essay on Nigerian strip weaving. This particular textile has a detailed history. Woven by Gbokowa of Ngarlu, the piece belonged to the Paramount Chief Madam Mabaja I of Bagbwe chiefdom in Sierra Leone. When Queen Elizabeth visited from 1961–2, the textile was placed on the floor as a carpet for the royal dais at Bo and was used by the queen. Paramount chiefs (both men and women) were drawn from ruling families designated by the British government, and Paramount chiefs were the local governing authorities empowered by the British colonial administrators beginning in 1896. For more information Sierra Leonean historical governing structures, see Joanna Edwards’ article on Mende country cloth in the National Museum of African Art’s 1992 History, design, and craft in West African strip-woven cloth: papers presented at a symposium organized by the National Museum of African Art, Smithsonian Institution, February 18-19, 1988. Washington, D.C.: The Museum and Reed and Robinson. Along the same traditional line as the carved ivory horn that began this lesson, carved horns are also local prestige items in Sierra Leone and Liberia. The Mende call this example of a Side-Blown Horn from Sierra Leone ndolo maha bului (“paramount chief horn”), and it is part of the chiefly regalia, as seen in the video linked on the slide. Intricately carved with a female figure and geometric designs, this early twentieth-century piece has an Arabic inscription denoting the original owner (Musa Abdi Wajif). Smaller horns are also used as decorative snuff containers, and often have chains for wearing the pieces on the body such that the compositional and decorative forms transfer across from musical instrument to bodily adornment. Although this piece is a light ivory color, many side-blown horns are reddish, likely from being rubbed with a substance like palm oil. For more on the use of side-blown horns in Liberian (Kpelle) music, see the Wesleyan University virtual instrument museum or W.A.Hart, ‘Early-nineteenth century chiefs’ horns from coastal Liberia’, African Arts, 1999, XXXII, 3, 62–7. The Dallas Museum of Art also has a lesson plan on Mende prestige arts. The Gbini Mask connects to the Siegmann and Perani article listed for undergraduates (above), and this marks a point in the lecture where instructors might ask for student participation in describing the numerous masks associated with men’s societies in the region. Poro is the men’s association often described as the complement to the women’s Sande society; it is an organization moderating community interaction, political relationships, and behavior. The society also mediates between spiritual and earthly forces, or, between the bush and village or city. Like the Sande society, men go through a period of education and initiation, often referred to as the bush school. Two terms, hale (Mende) and sale (Loma) are often used to discuss the power wielded by the spirits associated with masquerading; the terms signify the specialized knowledge or “medicine” gained through spiritual assistance. Masks appear as physical manifestations of the acquisition or manipulation of sale or hale. There are a number of masks associated with the society, and this lesson discusses one from the Mende. The Gbini mask is considered the most powerful mask in men’s masquerading, but as Siegmann and Perani write, its relationship to Poro is still being explored, and function may vary tremendously depending on the community. According to G.W. Harley (one of the first western scholars to describe the Poro society in detail in his Masks as Agents of Social Control in Northeast Liberia), the Gbini mask plays an important role in men’s initiation, and all scholarship about Gbini remark on its low, guttural sounds and its movement, providing another opportunity for student discussion about exhibition and on-site contexts for viewing artworks, especially ones that are originally in motion or accompanied by sound. The Dan and Mano peoples straddle the geographic region in northeastern Liberia and the western Ivory Coast. Ge (or Gle) is a term that refers to spirits or spiritual forces, and the mask is one manifestation of the spirit in performance. Dr. Dan Reed refers to the institutional and philosophical concept of the spirits as Ge and individual, specific forest spirits as ge, so think about the terminology as fluid and contextual. The ge spirit resides in a spiritual realm (gebo) with the ancestors and mediates between spiritual and earthly realms (between God, Zlan, and our world). When needed, the spirits are summoned through music and manifested through performance—a reminder that the face mask, like the Deangle Mask here, or even the whole masquerade costume (as seen, unusually, in this museum piece), is only part of the manifestation of the spirit. Deangle moderates boys’ initiation into adulthood. According to the Harn Museum, this mask is the manifestation of “a cheerful, nurturing, and beautiful female spirit. Deangle appears in ceremonies for male initiations and also begs for food from the families of the boys isolated in the initiation camps. Although the mask embodies a female spirit, the costume is worn by a man whose movements imitate those of women and who speaks in a high-pitched voice.” The masquerader’s body is completely covered by a long raffia skirt and cotton country cloth, including sleeves sewn shut to ensure not part of the dancer’s body is seen, as the spirit, not the dancer, controls the body and mask. The mask encapsulates ideals of feminine beauty with its slit eyes and finely worked features; each mask portrays and idealized Dan or Mano identity. For more information, see Harn’s information sheet here. This can be used to discuss collection contexts, as the University of Florida library and archives digitized the collector’s photograph album from his time in Liberia, including a photo of this mask being danced. Also see Daniel B. Reed, “Spirits from the Forest: Dan Masks in Performance and Everyday life,” in Visions from the Forests: Art of Liberia and Sierra Leone (2014). Dan carving is renowned for its fineness, and artworks like this Ceremonial Spoon denote important prestige functions for women in Dan society. The large-scale spoons (see context photograph for size estimation, they range from 1′ to 2′ in length) are known by a number of names, including Wa ke mia or Wunkirmian, translated loosely as “spoon associated with feasts,” or “at feasts acting woman.” Like on this spoon, the handles are often carved in the shape of a beautiful woman; it has been suggested that some are portraits. (See: Fischer, Eberhard, and Hans Himmelheber. The Arts of the Dan In West Africa. Zürich: Museum Rietberg, 1984) Handles may also be carved in shapes of animals or with geometric decorations. Sometimes, instead of a head, human legs are carved as the handle. The spoon carries with it a prestigious title granted to the most hospitable woman in the village (one with extraordinary skill in agriculture and organization), a woman who then prepares a large feast accompanying masquerade ceremonies. The forms of the piece, with the spoon’s deep belly (filled with rice, grains, or coins during performance and procession) is representative of and connects Dan womanhood to the provision of food and life. The spoon is also a manifestation of spiritual power, complementary to Dan masks. The woman’s face is idealized with slit eyes outlined in white pigment, full lips, a defined forehead ridge, and elaborately carved braided coiffure. For related works, see the Met website and also Barbara C. Johnson’s Four Dan Sculptors: Continuity and Change. San Francisco: Fine Arts Museums of San Francisco, 1986. 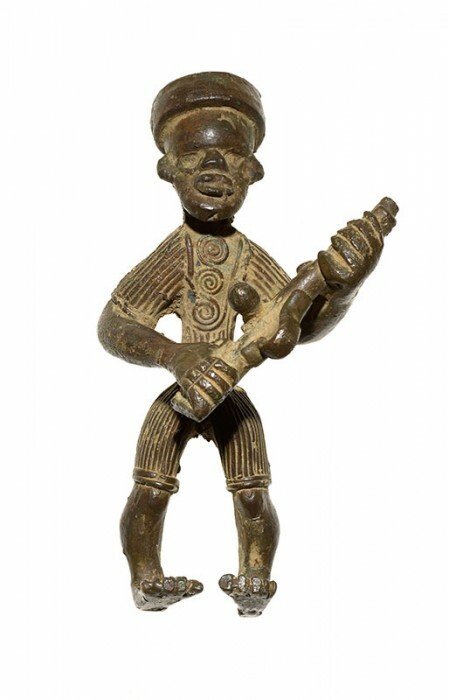 Brass casting has a long history in Liberia, but this Soldier is included to examine some of the continuity and change over the twentieth century. Heavy metal jewelry pieces were characteristic of Dan women’s attire denoting status and wealth in the nineteenth and early twentieth centuries. However, as the Republic of Liberia’s government spread from the coastal regions into the interior of the country, its policies caused cultural changes that resulted in status and prestige, manifesting in new forms. The material itself was precious; women’s jewelry was melted down to create new artistic forms after brass jewelry was outlawed in the 1930s due to a new health minister declaring it bad for the body, that it created infection from chafing and orthopedic issues due to wearing many heavy pieces. These small figures are the type of heavy metal piece of that era, although some brass female figures are assessed as belonging to an older tradition. This type often features genre scenes: women in daily tasks, soldiers in country cloth uniforms holding guns, or animals like tortoises or dogs. Precious, expensive pieces were stored carefully in cloth and were collected by locals and foreigners alike. One figural collection in the U.S. was collected—like the deangle from the Harn Museum—by a Firestone Rubber and Tire company employee. The soldier here wears a country cloth shirt and short pants, denoted by the striping typical of the sewn stripwoven country cloth seen above. John Leh of Gbabobli is one of the two best-known brass casters from twentieth-century Liberia; the other is Ldamie of Gaple. Leh cast his figural designs using the cire perdue (lost wax) method. Leh’s patrons in the 1920s and 1930s were government and missionary officials, and he commonly cast Liberian Frontier Force soldiers, a battalion formed in 1908 to defend the country’s borders from encroaching colonial powers, France and England. Rounded arms, shoulders, and legs characterize his work. For more, see Barbara C. Johnson, “Brass Casting in Liberia.” in Visions from the Forest: Arts of Liberia and Sierra Leone (2014). After reading the Viditz-Ward or Bishop article, ask students to discuss in a paragraph (or longer, if desired) two visual stereotypes about Africa and to engage how the articles frame Liberia and Sierra Leone as part of the broader Atlantic world. How do the visual arts allow audiences to challenge stereotypes, citing one image or work? This assesses prior knowledge and helps students challenges assumptions through engaging artworks. For the Siegmann or Phillips articles, students might also explore the Sierra Leone Heritage website to see videos of masks in action. Then ask them to compare and contrast a mask in motion to a mask in a museum collection. Have them describe the works to engage region-specific vocabulary and compare how a work exists in situ versus in a collection (stating awareness of the importance of context in arts viewing, previewing one of the lesson objectives). Compare and contrast list: Midway through the lecture, have students (individually or in groups) write a quick compare and contrast list for two works of art—one they have just viewed, and one new piece. This activity encourages immediate engagement with the material and prepares them to study for future test questions (featuring unknown works of art or object identifications). It also aids students in immediately reflecting and assessing what information they have gleaned from lecture at the moment. One-minute paper: ask students to describe one art form of Liberia or Sierra Leone in one sentence, stating one aspect of the work’s aesthetics and one aspect of its cultural relevance. Have them add a second sentence asking one question the work inspires them to ask about the arts of this region. Engage African art on social media: Tweet or Instagram a work of your choice at the National Museum of African Art—see their tweets and Instagrams for examples.